Part I: The World of the Military. Hall, The Importance of Understanding Military Culture. Coll, Weiss, Yarvis, No One Leaves Unchanged: Insights for Civilian Mental Health Care Professionals into the Military Experience and Culture. Part II: Special Populations. Yarvis, Beder, Treatment of War-induced Post-Traumatic Stress Disorder. Parkinson, French, Massetti, Care Coordination in Military Traumatic Brain Injury. Bell, Reardon, Working With Survivors of Sexual Harassment and Sexual Assault in the Military. 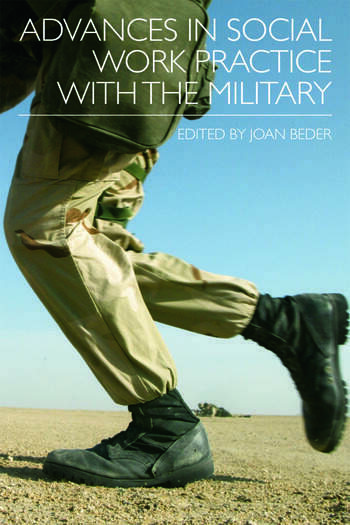 Beder, Jones, When They Return From Iraq/Afghanistan: The Needs of the Wounded. Cabrera, Figley, Yarvis, Helping the Combat Medic and Corpsman: Adapting to Both Primary and Secondary Traumatic Stress Down Range and Beyond. Bruner, Woll, The Battle Within: Understanding the Physiology of War-zone Exposure. Part III: Clinical Challenges. Beder, Those Who Have Served in Afghanistan/Iraq: Coming Home. Chapin, Family Resilience and the Fortunes of War. Jackson, Branson, Assessing and Responding to Suicidal Risk Among OIF/OEF Veterans. LaMorie, Operation Iraqi Freedom/Operation Enduring Freedom: Exploring Wartime Death and Bereavement. Everson, Perry, Wives. Roy, Skidmore, A Clinical Overview of Assessment and Treatment of Substance Use Disorders in Veterans and Service Members. Part IV: Services. Beder, Sullican-Sakaeda, Martin, Animal-assisted Intervention. Amdur, Batres, Belisle, Brown, Cornis-Pop, Mattewson-Chapman, Harms, Hunt, Kennedy, Mahoney-Gleason, Perez, Sheets, Washam, VA Integrated Post-combat Care: A Systemic Approach to Caring for Returning Combat Veterans. Part V: Unique Concerns for Practitioners Beckerman. Ethical Challenges When Working with the Military. Figley, Beder, The Cost of Caring Requires Self Care. Joan Beder, DSW, is a professor in the Wurzweiler School of Social Work at Yeshiva University in New York. She has been a clinical social worker for over 30 years and maintains a private clinical practice in Long Island, NY.